Contact Work is the most distinctive and unique part of the YL tool belt. Few others do it, and even fewer do it the way YL leaders do Contact Work. Yet, it is also the most challenging aspect of leadership for most leaders in YL. I am the product of great Contact Work, in fact my first day of ever hearing about YL was the first day that a new leader was sent out to do Contact Work. It is the purest form of our sacred work. As I like to say, the highest “title” anyone in YL can have is “Visitor”, and this comes in the form of a disposable sticky-backed label handed out at a front desk. It comes in lots of other forms too, and that is where the creative genius of our highest ranking comrades excel. A deck of cards with a different Contact Work challenge on each card. 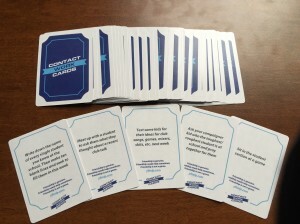 I put a lot of thought into them and decided to call them “Contact Work Cards”. The idea was born out of an article I read on how some people overcome fear and anxiety by setting up small goals for each day. As it turns out, when you make a small, specific, goal, there is a much better chance that you will make progress. You may fail or forget occasionally but overall a lot of progress is made through this approach. 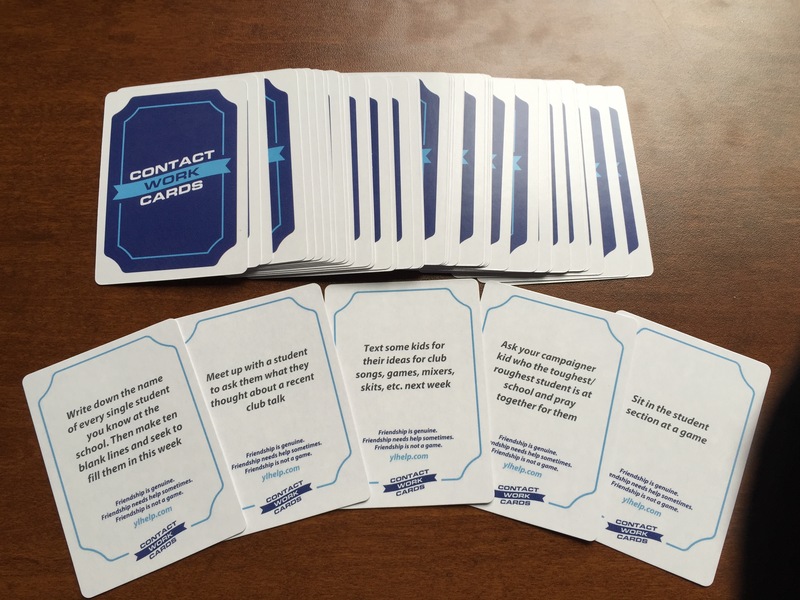 This is the general idea behind Contact Work Cards. The primary challenge to quality Contact Work is that is a pure form of incarnational ministry rooted in the imitation of Jesus and fueled by the power of the Spirit, and because of this Satan hates Contact Work. On a practical level, most people don’t have Contact Work regularly planned, unlike weekly club and campaigners, and because of this it simply is hard to fit in. Furthermore, many people simply aren’t sure what to do. Each of the 54 cards are written to overcome these obstacles. One important note: friendship is not a “game”, getting to know kids is not just a “challenge”, it must be genuine. Give every leader a card after club as their challenge for the following week. Then report back next week at club. Sign completed cards and put them back in the deck when done. Try to work through the whole deck as a team. I gave a pack to every club in my area and so far I’ve heard some fun reports and stories. One of the cards instructs the leader to get together with a club kid and do something nice for the family that hosts club. Last weekend we heard a knock at the door and found at our doorstep a huge card from the kids in our club and some homemade cookies! Didn’t see that one coming!